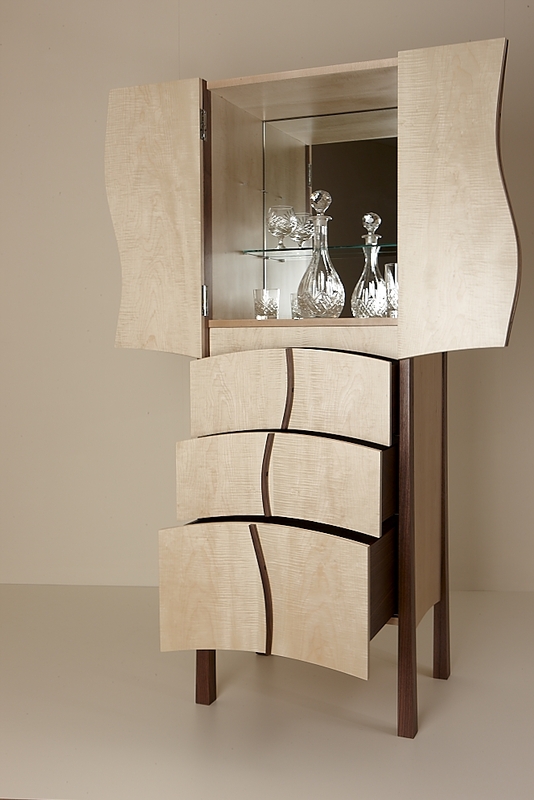 This drinks cabinet in walnut and steel successfully marries the hand crafted ethos with a glamour attitude. The rounded sides of the doors and the wavy steel handle that snakes down the front adds delicacy to the generous size of the cabinet. The cabinet sits solidly on a light frame of curved legs and steel conduits, the frame top re-enforced by a concealed steel plate. Inside, the character burr grain on the solid walnut is a perfect selection for the drawer front and the matching front of the pull out serving shelf, adding to the glamour of the internal lights and mirrors. The pull-out serving shelf is for drinks preparation and resembles a tray with the front, back and side edges proud of the panel. The wide internal drawer is lined with black 'Cosmopolitan' leather from Yarwoods. The small internal wine rack sits at the bottom of the cabinet and accommodates six bottles. The pleasing curves on the front of the walls echo the curved doors that will embrace the front of the cabinet. This detail also resembles sails and the Streamline Moderne period of Art Deco that the cabinet is influenced by. This piece is an experiment in old style glamour for modern living. It was a technical challenge in its range of components and techniques. I am particularly happy with the hand laminated walnut, which twists up the face of the cabinet as handles for the drawers and doors. As well as the mirror-backed drinks compartment and three soft close drawers for cocktail accoutrements and parlour games, Vita also includes a pop-out serving shelf for drinks preparation.